Using a variety of exercises and alternative therapies, a New York City hospital has reportedly helped patients with osteoarthritis. Such activities as tai chi, yoga and Pilates have led to reduced pain, better function, and a greater quality of life. It furthers the belief that patients can turn to exercise to help themselves. The Hospital for Special Surgery in Manhattan held classes weekly, and used such exercises as tai chi (a mainstay of Chinese medicine), yoga (from Ayurvedic medicine), Pilates (performed on chairs), and dance fitness. 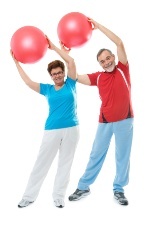 The exercises were specifically tailored to patients with osteoarthritis. The results were accumulated from surveys, which identified self-reported pain, balance, falls, and level of physical activity. An 11-point scale was used to measure muscle or joint pain. A 10-point scale was used to measure how much pain interfered with general activity, mood, walking ability, sleep, normal work, and enjoyment of life. A sample of 200 patients reported that 53% felt pain relief after the exercise programs. In a subset of 66 people who did not do any exercise before the classes, the percentage was even higher, at 62%. Pain intensity dropped from 4.5 to 2.7 in the exercise group. The participants identified a 54% improvement in how pain interfered with their quality of life. There were also small drops in the number of people experiencing falls and injuries that required a trip to the hospital. Osteoarthritis is the world’s most common form of joint pain. It is also the leading cause of disability in the United States. It afflicts about 50 million U.S. adults—or about 22% of the total population. And the numbers are rising, along with body weight, because obesity puts joints under great strain. Of course, losing weight—through exercise—is an excellent way to help relieve osteoarthritis pain. “Hospital-based exercise programs benefit people with osteoarthritis,” Hospital for Special Surgery, November 10, 2012.